The Race to Market Challenge is on! In anticipation of the upcoming launch of Windows Marketplace for Mobile, Microsoft announced today a new contest to reward developers called the “Race to Market Challenge”. From launch until the end of 2009, we’ll be rewarding the developer whose paid application earns the most revenue within the contest period and the developer whose free application is downloaded the most within the contest period. Winners will receive a prize package including a Microsoft Surface table and developer kit, free online marketing and promotion of their application, plus a one-of-a-kind trophy! For more details, visit the Race to Market Challenge website or read the official rules for contest details. 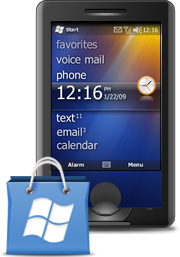 Windows Marketplace for Mobile opened for applications today so get your apps in soon. Good luck!